Messrs Millot, Vandewalle and Parmentier took some piranhas to Liege and lost half of a finger. In the process, though, they managed to record the Red Belly sound. The red-bellied piranha, Pygocentrus nattereri has a good bark when it is picked up from the water, as do many of its kind. This research went much further than simple music appreciation, with hydrophones supplying data on confrontation "barking", which occurred exactly as it had when the scientists picked up the aggressive fish. They proceeded to stimulate the swim bladder muscles and measured the bladder's vibration. The bark. It had numerous pulses and lasted 140!±17 ms, with a fundamental frequency of 120±4 Hz. A similar drum sound. It was a single pulse lasting 36±8 ms, with a fundamental frequency of 43±10 Hz. A soft croaking sound produced by the jaws, during chasing behaviour. It comprised three to four pulses, each lasting 3±1 ms, with a fundamental frequency of 1739±18 Hz. Discounting the croak, the two sounds investigated are made when two fish confront each other face to face, or when Sandie Millot picks one up. 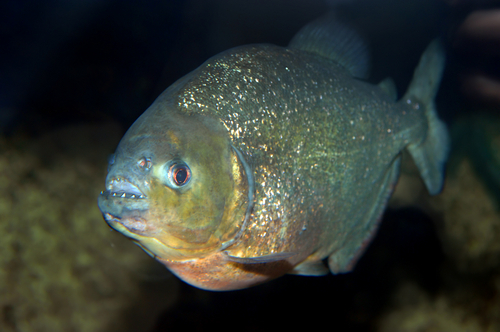 The drum sound is made only when the piranha fights for food or circles its opponent. Research will continue on mating behaviour after these discoveries. The piranha tank being small, Eric Parmentier assesses that for a future study of mating sounds, they will investigate fish in the field in Brazil. "It is difficult for the fish to reproduce in the tank, so I am sure we have to deploy hydrophones in the field to have the sounds that are produced during mating." A sort of Piranha honeymoon!